I was in San Francisco this weekend and was wandering around the Haight when I figured I'd check American Apparel to see if they had any new cool polishes. They did, and this is one of them: Meteor Shower. First of all, Hassid is an amazing black creme. One coat and it's nicely opaque and dries fairly quickly. Meteor Shower is a clear base full of random sizes and shapes of a kind of gold foil flake. More like random shards of gold. One thing about them is that a few of them do NOT lay flat, and for this reason I don't know how long this will last on me... the scratchy points are bugging me a little bit. But other than that, it looks pretty neat to me. 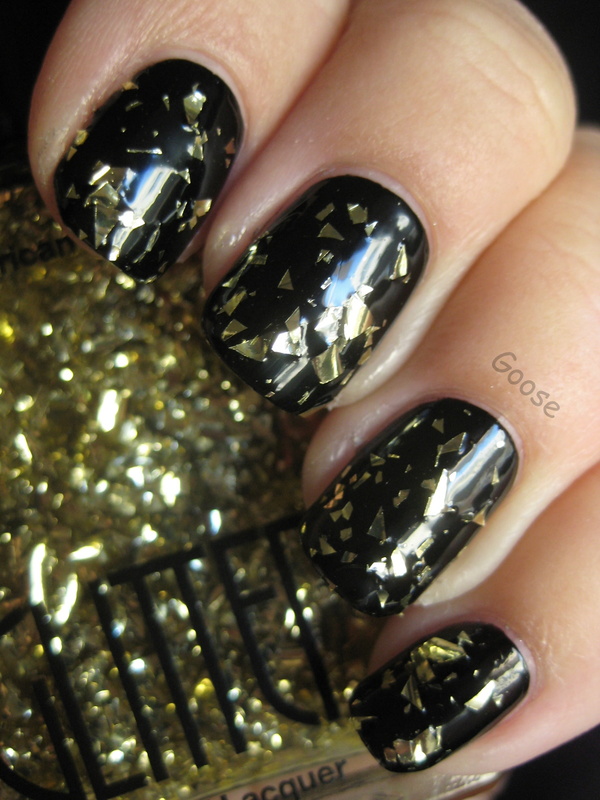 I love black and gold together and this combination looks classy and edgy at the same time. Wow!! That's an awesome glitter. I haven't seen anything like it. My name is Martine and I work for American Apparel. Every so often, we feature some of our favorite looks from blogs in a section on our website called Seen and Submitted. It includes a thumbnail and link to your original post. We chose one of yours if that's alright with you. Check out the links below. Ah, thanks for the link! Hey, here's a question, can we talk about why the black polish is called Hassid?